Notes And Updates: This article contains recommendations that have been superceded by the Tire Manufacturers. Tire pressure recommendations in Manufacturer's charts now include the additional pressure increase. It is no longer recommended that you add an additional 10 pounds of air above the required amount! In addition with the advent of Tire Pressure Monitoring Systems (TPMS), tire pressure can be conveniently monitored remotely in the RV. Tire pressure should be checked (and adjusted to specifications if necessary), each day prior to traveling, in addition to reviewing the pressures as a day of travel proceeds. Always adjust pressure when the tires are cold and do not remove air, since tire pressure will increase as tires warm up after traveling. As we take our units out of storage (for those of us Snowbirds who persevered through the snow) it is important to check over all systems and tires before traveling any distance. Tire condition and pressure are of utmost importance to our long-term enjoyment of our Bounders. Please take the time to check the pressures marked on the sidewall of the tire and inflate to that amount or up to 10 lbs. per square inch above that amount. Truck tires are rated to carry the load at a certain tire pressure and can be safely inflated above that amount by 10 PSI. Always check the pressure with the tires cold, and I recommend a monthly tire pressure check during the RV season unless you are traveling daily. In that case check them once a week. A hint that I learned from a trucker that makes it easy to check inflation of tires is to take a wooden pole about 3 feet long (I use a railing dowel) and tap the edge of each tire including both duals individually, each day before you leave. Listen to the sound, if each tire is inflated to the same pressure each tap will give off the same sound. It is a simple yet effective way to check tire pressure and if one tire sounds different then you can look closer to see if it looks deflated, and check the pressure of the tire with an accurate tire pressure gauge. I have found that just 3 PSI of reduced air pressure is easily identified by this method. I have also carried out this pressure check while getting gas. Adding air when tires are warm is not recommended, unless you have an obviously deflated tire. The ideal method of establishing what is the correct air pressure to carry in each tire is determined by having the Bounder weighed, loaded as you would to travel, at a weigh scale, ideally weighing each axle and wheel separately. 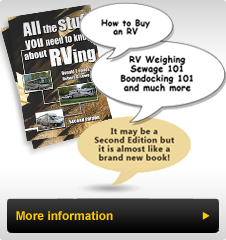 Using this information and the RV Tire Guide you can determine the minimum tire pressure for each tire. Remember: Dual tires should always be inflated to the same pressure (each tire and each axle). Front tires should also maintain the same pressure side for side. If you find that one side requires a higher pressure than the other does, then inflate both sides to that higher pressure. You might want to record the tire pressures on a sheet of paper, laminate it, and keep it with your spare tire or tire pressure gauge. That way you will know what the optimum tire pressure is year after year. One other reminder, if you tow a dinghy vehicle allow for its tongue weight on the Bounder. Tire condition is a whole other issue. Keep tires clean with mild soap and water. Michelin does not recommend using protectants since they react with the anti-oxidants in the rubber of tires. Tires on RV's do not usually wear out; they crack and age. Check for hairline cracks, on the sidewall and along the tread, uneven tread wear, and damaged from road hazards. If the tires are more than seven (7) years old they are candidates for replacement not withstanding the fact that they still have usable tread. Consult a tire specialist if you are unsure.